Property management companies may each have their own unique ways of doing business, but one thing is common to all: there are hundreds of things to remember each month. You need to keep track of payments owed, payments due, leases about to expire, and so much more. Sure, a good office assistant is invaluable in helping with all that, but human error can lead to costly mistakes. Instead of relying only on your own memory and the help of your assistant, let our rental management software, with a complete reminder system, help you make sure that you never forget another important bit of information again. The Reminder System, which is included in Tenant File’s software, allows you to choose the information that you want to remember. Once you have set your reminders, you can forget it. Tenant File will remind you at the intervals that you have selected. For example, you can choose to be reminded about tasks that are coming up in 14 days, 7 days or any other time period. Don’t let expiring leases catch you by surprise. As soon as a lease is written, you can enter a reminder. A couple of months (or any other time period) prior to the expiration, a reminder will pop up right on your screen. The above screen can be set to pop up each time that you enter the Tenant File. You are totally in control of what information that you see. Your choices include any reminders that you have created, any tenants that have balances due, any leases that are about to expire, funds due to owners, and amounts that are owed to the owners. 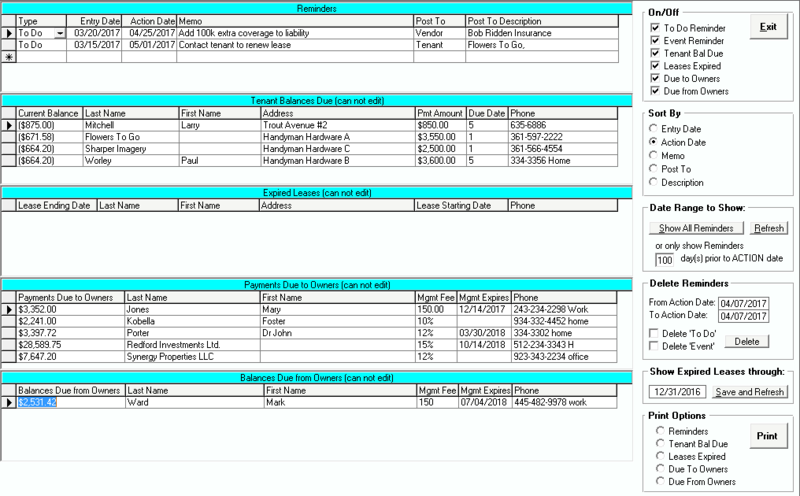 You have multiple sorting options to make the display of your data easy and informative. You can choose to be reminded of actions to take based on the 'Date Range to Show' button. For example, if you only want to see actions that you need to take within the next two weeks, you can enter 14 days as the reminder time period. Similar to that, you can choose to view leases that are going to expire using any date. In the property management business, your reputation is everything. Rental management software with a complete reminder system can help you make sure that you never forget to send a payment to an owner or a vendor. It can help you to stay on top of vacancies, so you can start looking for new tenants, well before a lease expires. Don’t try to remember everything on your own. It’s just not possible, and, thanks to Tenant File, it’s not necessary. Let our software serve as your personal reminder service. You’ll never again forget a payment or lease expiration date. Call today to learn more about our property management software.